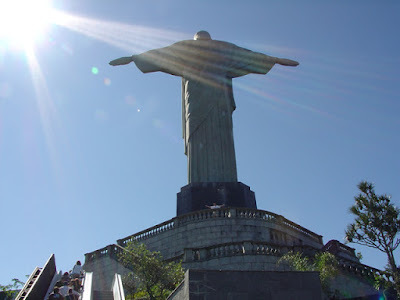 Christ the Redeemer (Portuguese: O Cristo Redentor, formerly Portuguese: Christo redemptor) is a statue of Jesus Christ in Rio de Janeiro, Brazil; considered the largest art deco statue in the world. The statue stands 39.6 metres (130 ft) tall, including its 9.5 metre (31 ft) pedestal, and 30 metres (98 ft) wide. It weighs 635 tons (700 short tons), and is located at the peak of the 700 metres (2,300 ft) Corcovado mountain in the Tijuca Forest National Park overlooking the city. It is one of the tallest of its kind in the world. The statue of Cristo de la Concordia in Cochabamba, Bolivia, is slightly taller, standing at 40.44 metres (132.7 ft) tall with its 6.24 metres (20.5 ft) pedestal and 34.20 metres (112.2 ft) wide. 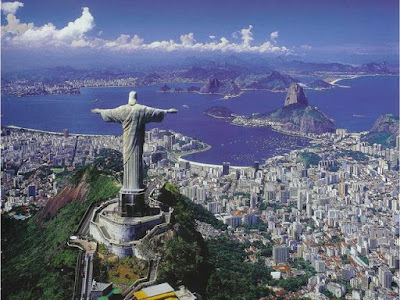 A symbol of Catholicism, the statue has become an icon of Rio and Brazil. It is made of reinforced concrete and soapstone. The idea for erecting a large statue atop Corcovado was first suggested in the mid 1850s, when Catholic priest Pedro Maria Boss requested financing from Princess Isabel to build a large religious monument. Princess Isabel did not think much of the idea and it was completely dismissed in 1889, when Brazil became a Republic, with laws mandating the separation of church and state. 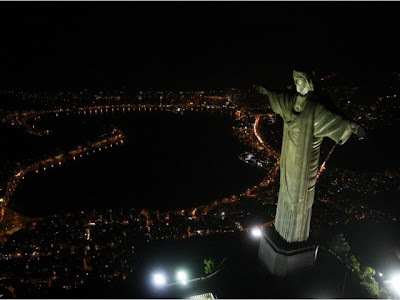 The second proposal for a landmark statue on the mountain was made in 1921 by the Catholic Circle of Rio. The group organised an event called Semana do Monumento ("Monument Week") to attract donations and collect signatures to support the building of the statue. The donations came mostly from Brazilian Catholics. The designs considered for the "Statue of the Christ" included a representation of the Christian cross, a statue of Jesus with a globe in his hands, and a pedestal symbolizing the world. The statue of Christ the Redeemer with open arms was chosen. Local engineer Heitor da Silva Costa designed the statue; it was sculpted by French sculptor Paul Landowski. A group of engineers and technicians studied Landowski's submissions and the decision was made to build the structure out of reinforced concrete (designed by Albert Caquot) instead of steel, more suitable for the cross-shaped statue. The outer layers are soapstone, chosen for its enduring qualities and ease of use. Construction took nine years, from 1922 to 1931. The monument was opened on October 12, 1931. The cost of the monument was $250,000. 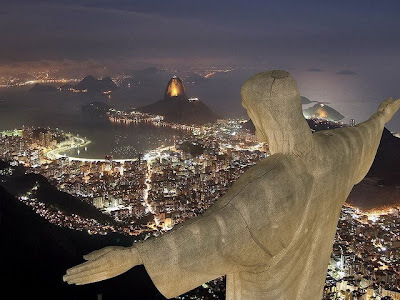 The statue was meant to be lit by a battery of floodlights triggered remotely by shortwave radio pioneer Guglielmo Marconi, stationed 5,700 miles (9,200 km) away in Rome, but poor weather affected the signal and it had to be lit by workers in Rio. The statue was struck by lightning during a violent electrical storm on Sunday, February 10, 2008. The storm caused havoc in Rio, but the statue was left unscathed because soapstone, the material forming the outer layers of the statue, is an insulator.In October 2006, on the statue's 75th anniversary, Archbishop of Rio Cardinal Eusebio Oscar Scheid consecrated a chapel (named for the patron saint of Brazil - Nossa Senhora Aparecida) under the statue. This allows Catholics to hold baptisms and weddings there. 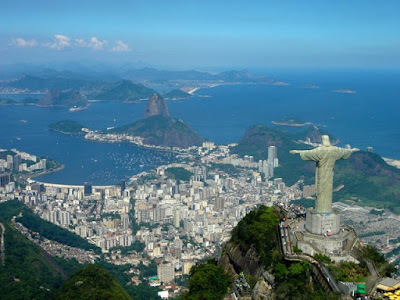 On 7 July 2007, Christ the Redeemer was named one of the New Seven Wonders of the World in a list compiled by the Swiss-based The New Open World Corporation.Additionally, leading corporate sponsors including Banco Bradesco and Rede Globo put large sums of money in the effort to have the statue voted into the top seven. On 7 July 2007, Christ the Redeemer was named one of the New Seven Wonders of the World in a list compiled by the Swiss-based The New Open World Corporation. Additionally, leading corporate sponsors including Banco Bradesco and Rede Globo put large sums of money in the effort to have the statue voted into the top seven.